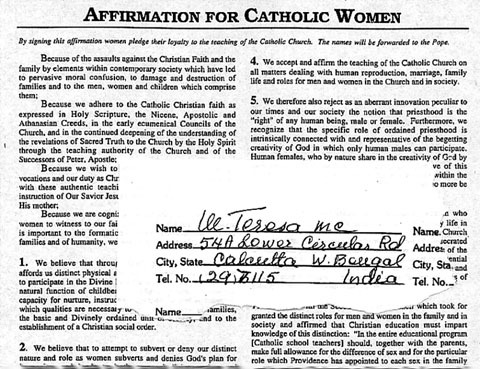 Mother Teresa signed the Affirmation for Catholic Women in January 1986. Here is her signature. All the Missionaries of Charity in the United States signed this statement of fidelity to the Church. 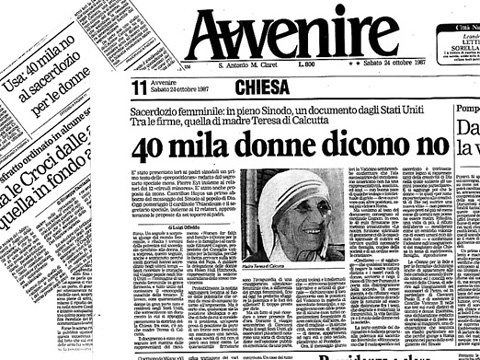 On October 23, 1987, during the Synod on the Laity, a list of 40,000 Affirmation signers (including Mother Teresa's) was presented to the Holy See. CLICK HERE for complete account. "By blood, I am Albanian. By citizenship, an Indian. By faith, I am a Catholic nun. As to my calling, I belong to the world. As to my heart, I belong entirely to the Heart of Jesus". Small of stature, rocklike in faith, Mother Teresa of Calcutta was entrusted with the mission of proclaiming God's thirsting love for humanity, especially for the poorest of the poor. "God still loves the world and He sends you and me to be His love and His compassion to the poor." She was a soul filled with the light of Christ, on fire with love for Him and burning with one desire: "to quench His thirst for love and for souls." This luminous messenger of God's love was born on August 26, 1910 in Skopje, a city situated at the crossroads of Balkan history. The youngest of the children born to Nikola and Drane Bojaxhiu, she was baptised Gonxha Agnes, received her First Communion at the age of five and a half and was confirmed in November 1916. From the day of her First Holy Communion, a love for souls was within her. Her father's sudden death when Gonxha was about eight years old left in the family in financial straits. Drane raised her children firmly and lovingly, greatly influencing her daughter's character and vocation. Gonxha's religious formation was further assisted by the vibrant Jesuit parish of the Sacred Heart in which she was much involved. At the age of eighteen, moved by a desire to become a missionary, Gonxha left her home in September 1928 to join the Institute of the Blessed Virgin Mary, known as the Sisters of Loreto, in Ireland. There she received the name Sister Mary Teresa after St. Thérèse of Lisieux. In December, she departed for India, arriving in Calcutta on January 6, 1929. After making her First Profession of Vows in May 1931, Sister Teresa was assigned to the Loreto Entally community in Calcutta and taught at St. Mary's School for girls. On May 24, 1937, Sister Teresa made her Final Profession of Vows, becoming, as she said, the "spouse of Jesus" for "all eternity." From that time on she was called Mother Teresa. She continued teaching at St. Mary's and in 1944 became the school's principal. A person of profound prayer and deep love for her religious sisters and her students, Mother Teresa's twenty years in Loreto were filled with profound happiness. Noted for her charity, unselfishness and courage, her capacity for hard work and a natural talent for organization, she lived out her consecration to Jesus, in the midst of her companions, with fidelity and joy. On September 10, 1946 during the train ride from Calcutta to Darjeeling for her annual retreat, Mother Teresa received her "inspiration," her "call within a call." On that day, in a way she would never explain, Jesus' thirst for love and for souls took hold of her heart and the desire to satiate His thirst became the driving force of her life. Over the course of the next weeks and months, by means of interior locutions and visions, Jesus revealed to her the desire of His heart for "victims of love" who would "radiate His love on souls." "Come be My light," He begged her. "I cannot go alone." He revealed His pain at the neglect of the poor, His sorrow at their ignorance of Him and His longing for their love. He asked Mother Teresa to establish a religious community, Missionaries of Charity, dedicated to the service of the poorest of the poor. Nearly two years of testing and discernment passed before Mother Teresa received permission to begin. On August 17, 1948, she dressed for the first time in a white, blue-bordered sari and passed through the gates of her beloved Loreto convent to enter the world of the poor. After a short course with the Medical Mission Sisters in Patna, Mother Teresa returned to Calcutta and found temporary lodging with the Little Sisters of the Poor. On December 21 she went for the first time to the slums. She visited families, washed the sores of some children, cared for an old man lying sick on the road and nursed a woman dying of hunger and TB. She started each day in communion with Jesus in the Eucharist and then went out, rosary in her hand, to find and serve Him in "the unwanted, the unloved, the uncared for." After some months, she was joined, one by one, by her former students. 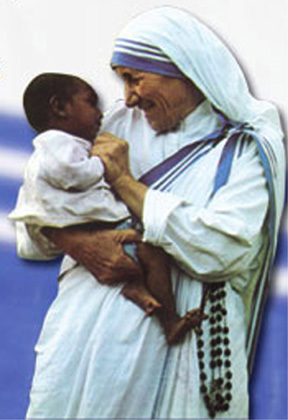 In order to respond better to both the physical and spiritual needs of the poor, Mother Teresa founded the Missionaries of Charity Brothers in 1963, in 1976 the contemplative branch of the Sisters, in 1979 the Contemplative Brothers, and in 1984 the Missionaries of Charity Fathers. Yet her inspiration was not limited to those with religious vocations. She formed the Co-Workers of Mother Teresa and the Sick and Suffering Co-Workers, people of many faiths and nationalities with whom she shared her spirit of prayer, simplicity, sacrifice and her apostolate of humble works of love. This spirit later inspired the Lay Missionaries of Charity. In answer to the requests of many priests, in 1981 Mother Teresa also began the Corpus Christi Movement for Priests as a "little way of holiness" for those who desire to share in her charism and spirit. The whole of Mother Teresa's life and labor bore witness to the joy of loving, the greatness and dignity of every human person, the value of little things done faithfully and with love, and the surpassing worth of friendship with God. But there was another heroic side of this great woman that was revealed only after her death. Hidden from all eyes, hidden even from those closest to her, was her interior life marked by an experience of a deep, painful and abiding feeling of being separated from God, even rejected by Him, along with an ever-increasing longing for His love. She called her inner experience, "the darkness." The "painful night" of her soul, which began around the time she started her work for the poor and continued to the end of her life, led Mother Teresa to an ever more profound union with God. Through the darkness she mystically participated in the thirst of Jesus, in His painful and burning longing for love, and she shared in the interior desolation of the poor. During the last years of her life, despite increasingly severe health problems, Mother Teresa continued to govern her Society and respond to the needs of the poor and the Church. By 1997, Mother Teresa's Sisters numbered nearly 4,000 members and were established in 610 foundations in 123 countries of the world. In March 1997 she blessed her newly-elected successor as Superior General of the Missionaries of Charity and then made one more trip abroad. After meeting Pope John Paul II for the last time, she returned to Calcutta and spent her final weeks receiving visitors and instructing her Sisters. On September 5 Mother Teresa's earthly life came to an end. She was given the honor of a state funeral by the Government of India and her body was buried in the Mother House of the Missionaries of Charity. Her tomb quickly became a place of pilgrimage and prayer for people of all faiths, rich and poor alike. Mother Teresa left a testament of unshakable faith, invincible hope and extraordinary charity. Her response to Jesus' plea, "Come be My light," made her a Missionary of Charity, a "mother to the poor," a symbol of compassion to the world, and a living witness to the thirsting love of God. 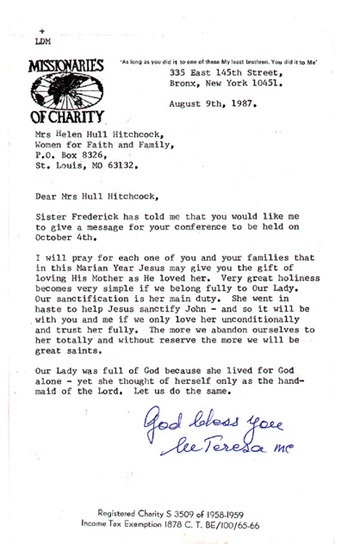 Less than two years after her death, in view of Mother Teresa's widespread reputation of holiness and the favors being reported, Pope John Paul II permitted the opening of her Cause of Canonization. On December 20, 2002 he approved the decrees of her heroic virtues and miracles.